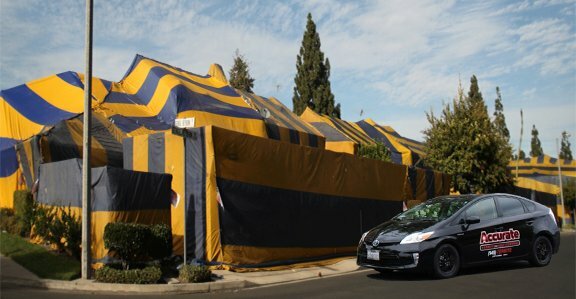 Fumigation typically involves Termite Tenting, a process by which the building is sealed in large, impenetrable tent or tarp. Gaseous pesticides are pumped into the tent, where they can reach all areas of the house, including structural beams, behind walls, etc. Fumigation treats the entire building, as opposed to Local Termite Treatment. Fumigation is the best option when termites have reached areas that are not accessible for local treatment, if the infestation is too widespread for local treatment, or if the infestation has spread to structural beams. While fumigation is most often utilized for buildings with extensive termite damage, it is not uncommon to tent / fumigate homes or buildings that have severe roach or even bedbug infestations. Simply put, fumigation is highly effective. We fully realize that leaving your home or business for a few days can be both inconvenient and challenging, so we have simplified the process for our customers. We provide a fumigation plan to help you prepare your home or business, and even provide bags or containers to keep your stored items safe during the fumigation process. We’ll consult with you every step of the way, making sure that you are totally prepared and worry-free on the day fumigation commences. At Accurate Termite & Pest Control, we have performed hundreds of fumigations, ranging from tenting small homes and sheds, to large condominium complexes with many buildings. No building is too large or too small for effective fumigation and pest control. Are Termites Active In Cold Weather Months? Is Termite Damage Covered Under My Homeowners Insurance?